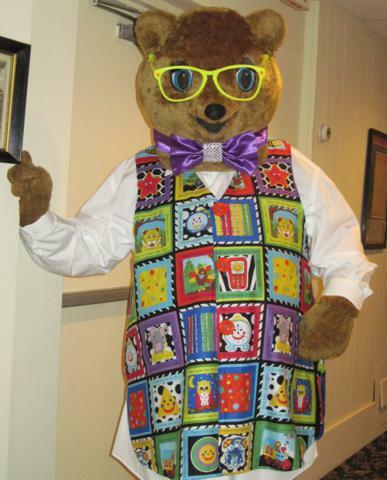 Kody O'Bear | Kody's Kids, Inc.
You can’t miss this 6-foot, fuzzy teddy-bear in his jazzy vest and colorful glasses. He is always ready to strut his stuff and give out free hugs! You can see Kody in our photo gallery. Kody O’Bear takes great pride in being Kody’s Kids, Inc. Ambassador and helping children that are facing challenges. He makes special appearances at fundraising events, parades, and youth activities to further the awareness of the Kody’s Kids, Inc. mission. Kody also is a team member of the Kody’s Kids Learning Program for preschool and kindergarten age children. Kody and his team, as part of our Learning Program, visit and inspire children of preschool and kindergarten age from all backgrounds to learn the importance of reading, healthy habits, and kindness to others. Healthy habits include the importance of proper nutrition, physical activity, oral hygiene, and sun safety. The Kody O’Bear network was created to inspire students and parents to discover educational and entertaining subjects together. You can learn more about Kody and his network at www.kodyobear.com.